Weighing in at over 6 GB, in development for almost a decade, just a couple of weeks ago updated for the umpteenth time (v1.0.0b7), and officially still in beta stage - Ghost Recon: Heroes Unleashed is not your average Ghost Recon mod. We talked to its author, ApexMods, to learn about this huge endeavor, to find out what started this odyssey, and what keeps it going after all these years. Hi Apex! Before we look at Heroes Unleashed, can you share with us your gaming and modding background? Hi Rocky. First of all, thank you very much for the interview. It's quite an honor to be featured at GhostRecon.net, after all this site is the largest Ghost Recon fan community on the planet, so I'm very humbled by the huge audience and appreciate the chance to talk about Heroes Unleashed. My gaming background? Shocking news - I am a Mac gamer (yes, we do exist). I've been a Mac fanatic since the late 80s / early 90s, and while I've also always had PCs and various consoles, I still prefer the Mac for gaming (and in general). My first shooter was actually THE first shooter - id Software's Wolfenstein 3D (1992), but the one that really grabbed me was (pre-Microsoft) Bungie's Marathon (1994), a (then) Mac-only science-fiction first-person shooter with a heavy emphasis on storytelling and an unbelievably rich background. The Marathon Trilogy also got me started with game mods. Since then I've modded various other titles, mostly the usual FPS (Doom, Duke Nukem 3D, Quake, Unreal etc.) and RTS (Warcraft, Command & Conquer, Total Annihilation, Starcraft, Company of Heroes etc.) and occasionally other genres. Nothing to write home about though, and certainly nothing on the scale of Ghost Recon: Heroes Unleashed. When was Heroes Unleashed first released and how many downloads do you think there have been since then? First release was here at GhostRecon.net in December 2008, just before Christmas. The beginnings were very humble, of course there was virtually no media coverage, and in the first couple of months the mod got attention largely through word of mouth. It then got picked up by a couple of Mac-centric web sites and later a few PC gaming sites too, but all just in the form of very brief mentions, there were no featured articles or anything like that. Still, slowly but steadily the downloads count kept rising, and more and more sites started mirroring the mod. At first, GRHU downloads were only hosted at GameFront (known as FileFront then), later they were also made available through ModDB, FilePlanet, StrategyInformer, MacGameFiles, ShackNews, etc. as well as several online file storage sites like MegaUpload, MediaFire, 4shared, etc. In addition, several Ghost Recon clans and fans mirror the mod on their own servers. Some even from half a world away - a friend recently told me that he had found the mod mirrored at several South American and Asian sites. In the beginning I tried to keep detailed track of the downloads count, but once all those mirrors started popping up everywhere it got very difficult. Today I just monitor a couple of the major sites and of course the main mirrors I control myself. At last count, Heroes Unleashed had been downloaded well over 50,000 times, not counting alternative download channels like e.g. torrents and newsgroups. Since I added the new ModDB mirror, that one alone has already served over 25,000 downloads. The latest version of GRHU was downloaded about 1,000 times within 10 days of release. It's so amazing to see 100 downloads every day for an add-on catering to 10-year old Ghost Recon. A very nice testament to the lasting appeal of this wonderful game. What was your inspiration for creating such a massive Ghost Recon mod? Probably not what you would expect. 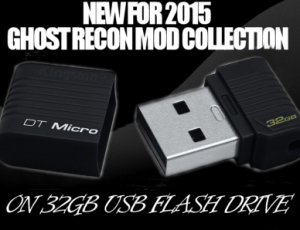 It started out as my effort to port Ghost Recon mods to Mac just for me and some friends. Back in the day when the original Ghost Recon had just been released we had a group of regular players - all Mac gamers - who fell in love with Ghost Recon but were a little frustrated that most mods were incompatible with the Mac version. Later on, conversions for Mac slowly got more readily available through the efforts of Mac gaming sites like DamnR6 and MacGamingMods, thanks to Mauti and Monoman, two huge heroes of the Mac Ghost Recon scene. Still, one problem remained, because many of the mods were also incompatible with one another, for example you would find a mod with a great map you wanted to play on, but that mod wouldn't work properly with another mod containing your favorite weapon or player skin etc. While Ghost Recon's support of 'modular modding' (allowing to have several mods active at once) in theory makes it very attractive to combine different game modifications, in practice this may also lead to a variety of problems, from smaller issues like visual glitches up to serious trouble e.g. the game crashing or not launching at all. I've always been a bit (actually very!) compulsive about these things, and being faced with the ongoing incompatibilities annoyed me immensely, so I began collecting assets like maps and weapons from different mods into one, painstakingly adjusting whatever was required to achieve complete compatibility. Our small group of players used this "compilation" mod all the time, and next to the addition of content I soon started working on other game improvements. I wanted the game to be even more realistic and demanding, there were also a couple of UI kinks that needed ironing out, and some of the graphics called for an overhaul. I found more and more things to improve, refine, and polish in Ghost Recon, so I set out to slowly but surely work on pretty much any and all aspects of the game. 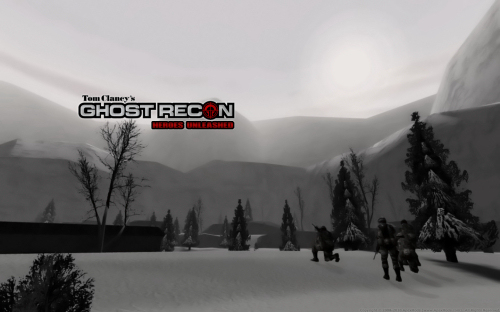 Everything I modified went into this one Ghost Recon mod I had started years and years ago - Heroes Unleashed. HU grew to an impressive size and featured loads and loads of things I wouldn't want to live without anymore when playing Ghost Recon. One day in 2008, admittedly quite late in the game's life, I looked at it all and finally decided to work on an official release of Heroes Unleashed, because I realized that I had gained so much from Ghost Recon and its fan community and actually had given back so little. I wanted Heroes Unleashed to be my tribute to Ghost Recon, to its makers, to its modders, to all its fans out there. Going public meant securing permissions from all the mods I had used content from, so you can imagine how much work it was just to recall every single asset utilized in GRHU, let alone where it had originally come from, and who to contact for permission. Actually reaching all those modders after these many years was no easy task either, and it also required quite a bit of patience. In the end everything worked out just fine, and everyone I contacted allowed their work being used in Heroes Unleashed. Oh, and I even had help from some friendly folks at Red Storm Entertainment. Looking back now, and seeing the enjoyment the mod brings to other Ghost Recon fans, reading all the emails and forum posts and other kinds of feedback makes the thousands of work hours I put into this well worth it, and I will probably keep developing further updates to Heroes Unleashed for a long time to come. For anyone who might not have already played, heard of, or seen Heroes Unleashed, can you outline what the mod offers fans of Ghost Recon? First of all, Heroes Unleashed does not fundamentally change Ghost Recon's gameplay or story environment. It just attempts to improve many little details of the game as much as possible while remaining true to Ghost Recon's core philosophy, concept, and atmosphere. GRHU simply wants to offer fans a whole lot MORE of the true Ghost Recon experience. The mod aims to indefinitely prolong the life of our beloved game by maximizing its already very addictive replayability - through adding more content, more variety, and by emphasizing what makes Ghost Recon so unique: The perfect balance between action game and realism simulator, which means a strong focus on realistic tactical squad-based gameplay, paired with intuitive controls, unrivaled immersion, and near-perfect situational awareness. GRHU wants to integrate some of the the best efforts of Ghost Recon's modding community into one comprehensive (and fully compatible) package and on top of that adds loads of innovative new features and enhancements. The current version of Heroes Unleashed (v1.0.0b7) contains 175 maps and missions, over 100 game types, more than 250 weapons, and also features increased realism and gameplay improvements throughout. Among other things, the mod offers more authentic visual fidelity for weapons, equipment, characters, maps etc., improved weapon and environmental sounds, closer to real-life weapon properties, handling, ballistics, more realistic bullet penetration and wounding system, improved friendly and enemy AI, greater randomization in the layout and structure of game types and missions, refined user interface elements, and so on and so forth. By now there really aren't that many stones left unturned by Heroes Unleashed. Please remember that the mod is still in beta though, and while I have thoroughly tested everything there may still be a couple of hidden issues. For the full release (whenever that may be ready) I still want to finish re-scripting the entire campaign and expand it with custom missions among many other things. So there's still lots of stuff to look forward to in future versions. Of all the content, what are you particularly pleased with in Heroes Unleashed? GRHU's most obvious asset is of course the sheer amount of content in one balanced and fully compatible package. This would not have been possible without the incredible talent of all the other Ghost Recon modders out there creating that original content in the first place. My personal modeling skills are far from expert, and the maps, weapons, characters, vehicles etc. these guys and gals keep coming up with are just breathtaking. I owe all of them my utmost gratitude, and Heroes Unleashed probably owes them its existence. I simply cannot stress this enough, because GRHU gets a lot of limelight it actually owes to the countless Ghost Recon mods out there that made it possible. Next to the abundant content, one of my personal favorite features of Heroes Unleashed is more difficult to grasp, because it's the weapons handling and ballistics model I developed for the mod. It is probably the most complex math I ever had to do since school, and it fills so many different spreadsheets and contains so many different formulas that I actually have a hard time understanding it myself sometimes, especially since I lost a huge chunk of my developer's notes in a (multiple) hard drive crash some time ago (please don't ask - it's a long story of my clumsyness and stupidity). Anyhow, there was some information out there how external ballistics and bullet penetration was supposed to work in Ghost Recon according to the original developers. I say "was supposed to", because after extensive testing I came to the conclusion that it simply doesn't work like that, at least not in a way that maximizes realism in weapons characteristics. I don't know how much time I spent on this so far, but it is a truly ridiculous amount that occasionally makes me doubt my sanity. Think about the amount of weapons in Heroes Unleashed and then imagine that a single rifle or pistol will sometimes require an entire day to go through all the spreadsheets and formulas. Yep, nuts. Anyhow, I am happy with most of the gun characteristics, although I still have a couple of overhauls planned e.g. for a specific handling problem and AP bullet penetration. The solutions are partly in my head and partly on paper (read: hard disk), but haven't made their entry into the release just yet. But don't worry, those concern minor things most people probably wouldn't notice much anyhow, and I will still implement them in a future update. Lastly I want to mention the single-player and co-op multiplayer game types I scripted for Heroes Unleashed. As I just didn't have enough time yet to get into individual mission scripting for each of the 175 maps, I wanted to offer as much replayablility for them through map-independent game types, so I spent a huge amount of time on those, in particular on the random mission generator "Black Ops", which among many other things offers thousands of possible objective combinations. For Black Ops I literally took Ghost Recon's scripting capabilities to the absolute extreme. I crammed the script so chock-full of features that it actually reaches the size limit the game engine can compile. I think there's exactly 2 empty bytes left, which is the equivalent of a single alphanumeric character. Why do you think even after three more games in the Ghost Recon series, there remains such an interest in playing the original game from 2001? Short answer: Because there hasn't been another game like Ghost Recon ever since. Not... even... close...! My long answer would probably fill a book (hey, nice idea - maybe I'll do that some day), so let's settle for a "medium" version. Indeed Ghost Recon is unique. Note that I just call the game "Ghost Recon" and not "original Ghost Recon" or "the first Ghost Recon" or "Ghost Recon from 2001" or whatever, because to me - and to many other fans - there is just ONE Ghost Recon. I know this is probably not exactly what you want to hear at GhostRecon.net, because this site covers the entire series, but I simply cannot relate to the later titles in the franchise at all, as they have lost everything that made Ghost Recon so special in my eyes. The way the game lets you choose your approach of a mission freely, allows you to roam the maps at will, doesn't hold your hand through everything - the completely open non-linear gameplay warrants a player's deliberation, demands that you bring more to the battlefield than quick reflexes. Ghost Recon will actually cause you to employ tactical gameplay, because if you don't, it will simply and unforgivingly kill you. There's no miracle shield that let's you walk away from a barrage of full-auto fire - in Ghost Recon it's one direct hit and you're gone. There is no regenerating health - it's one shot, one kill. There are no invisibility cloaks, either. If you just run across an open field in hostile territory the enemy will see and engage you - and send you home in a body bag. By today's standards Ghost Recon's audio-visual qualities may not be much to brag about, but once you get in there and move through a forrest or across a mountain pass, always on the look out for that deadly enemy while you're measuring your every step, carefully watching your every move, and you see those trees slowly stirring in the wind, hear a bird's cry and a wolf's howl, you feel like you're really there, like it is really YOU with that M4A1 carbine in your hands and the gravel under your boots, and sooner or later you will realize that true immersion has almost nothing to do with graphics detail. Everything in Ghost Recon just immediately feels natural, uncomplicated. The easy intuitive control of your game character's movement does its part in letting you forget that you are in fact looking at a computer screen. It is impossible to adequately describe it to someone who hasn't experienced it, but this is Ghost Recon's primary quality in my book - it just keeps dragging you in, further and further, again and again, until you completely forget it's a game that you're playing. There is a time for every Ghost Recon player when you first realize the full extent of this amazing phenomenon, when you lean towards your screen trying to look around its boundaries, when a shot fired nearby has you jump out of your seat in total shock, with a racing heart and a dry throat. Total immersion - that is Ghost Recon. All of the so-called Ghost Recon sequels completely failed to deliver any of this, and other games never picked it up, either. Most modern shooters grab your hand and drag you through a narrow corridor from one mind-numbing shooting gallery to the next, with the actual gameplay usually not being much more than a feeble excuse to get to the next ridiculous cinematic sequence. The only realism you'll encounter is visual, and even that is mostly spoiled by e.g. over-the-top explosions and giant muzzle flash taken straight from hollywood blockbusters. To drop an enemy requires emptying an entire clip, and even that is no guarantee they will not get back up after a few seconds of "resting". Built-in game cheats like that asinine bunny-hopping, x-ray vision, or invisibility cloaks do the rest to destroy the last remnants of hope for deliberate tactical gameplay, so you'll always end up with the run-and-gun, die, respawn, rinse, repeat gameplay that is the hallmark of todays stupidity shooters, whether they are called Call of Duty, Battlefield, or Medal of Honor. On the other end of the spectrum you have full-scale war simulators like the ArmA, VBS, or Operation Flashpoint series. While they do offer realism and largely avoid that abysmally empty-headed hollywood gameplay of the run-and-gun faction, they fail to deliver the directness of Ghost Recon's gritty blood-sweat-and-tears squad-based gameplay. Their inclusion of mechanized land, naval, and air combat on gargantuan map sizes with the myriads of settings and options and menus and gimmicks this entails, in the end leads to such overly cumbersome complexity that it pretty much eliminates any chance for immersion. Their controls are just far too clumsy to get a proper immediate feel for your character and also make it near impossible to have him move or act in a way that resembles direct response. These titles try to be the jack of all trades and end up being the master of none. In conclusion, that's why people still play Ghost Recon. Because between mindless unrealistic interactive movies a la Call of Duty and ArmA's awkward scale simulation minutiae, Ghost Recon offers a place for gamers who just can't be bothered with either. Ghost Recon was, is, and probably always will be, the King of tactical shooters. There is so much content in Heroes Unleashed, what would you suggest to gamers to play first to get the feel for what you tried to achieve with this mod? Launch a multiplayer co-op game, set it to "Elite" difficulty, random maps, no respawn, no threat indicator, no IFF, no time limit, select the "Black Ops" game type and the "Joint Force (Co-Op/Solo)" soldier config, pick from the dozens of player characters and the hundreds of weapons, and just get going. I think you'll know what I try to achieve soon enough. Thank you, Apex, for taking the time for this interview. Thank you, Rocky. It's been my pleasure. 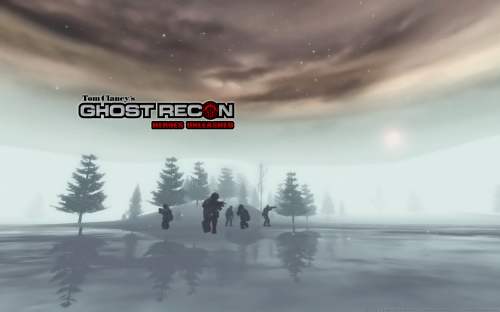 DOWNLOAD the Ghost Recon: Heroes Unleashed expansion pack right now right here at GR.net. Please leave feedback and discuss Heroes Unleashed in its FORUM THREAD. So there you have it, folks. Ghost Recon lives on through the almost one thousand mods created for this unique game. Several major new modding projects for GR are still in the making, and it looks like Apex will continue to expand and refine Heroes Unleashed indefinitely. Add the recent announcement of GhostRecon.net's permanent dedicated Ghost Recon game server and it's good times for GR fans all around. We will give the Ghost Recon fan community even more reason to celebrate with a little surprise event in the near future, so stay tuned to GhostRecon.net.